Maximize the grip you get in your footwear. TRUSOX uses INEX technology, non slip performance pads, on the inside and outside of the foot grips. The pads on the outside of the product grip your footwear, and the pads on the inside grip to your foot itself, allowing your foot and footwear to become one ! TRUSOX are made with revolutionary non-slip technology pads, otherwise known as INEX, which ensure that you are secure in your footwear and your foot doesn’t slide. The pads are made with technology that is activated as you start to perspire, meaning TRUSOX work better as they acclimatise to your feet. INEX allows you to generate greater speed and agility, while making you feel more secure in your footwear, and feel safer that the grip you get from TRUSOX won’t let you down at that vital moment. The mid-calf TRUSOX come in two varieties: cushioned and thin. The thickness variance relates to the cotton on the sole of the foot grips. Cushioned are of a similar thickness to a regular sports sock, whereas the thin are of a finer weave, resulting in a much thinner, less bulky product. 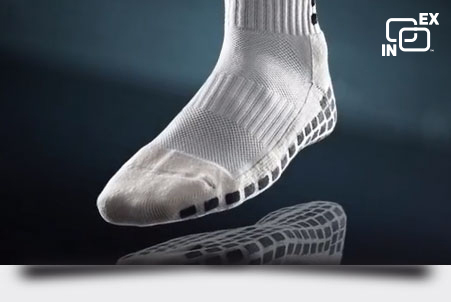 The ankle length TRUSOX come only in the thin, whereas the full length are only available in cushioned. TRUSOX cannot be worn with another sock over the top, or underneath; this creates a point of slippage which makes the TRUSOX ineffective. You can wear two pairs of TRUSOX together, which has proven more comfortable for those who require an even tighter fit within their footwear, whilst maintaining the grip TRUSOX give. If the INEX pads are bunching up, this means the TRUSOX you are wearing are too big and you need to go to the next size down. A single pair of TRUSOX can last for two years and more when looked after and washed correctly. We recommend a machine wash at in cold water no warmer than 30 degrees, or a hand-wash in cold water to achieve the best results. TruSox can be pre-treated with fabric softener and stain remover but NOT bleach or boiled, as this will damage the technology within the anti-slip applications.